Dissemination can be seen as a communication process between scientists. Over the course of several publications, they expose and support their findings, while discussing stated claims. Such discourse structures are trapped within the content of the publications, thus making the semantics discoverable only by humans. In addition, the lack of advances in scientific publishing, where electronic publications are still used as simple projections of paper documents, combined with the current growth in the amount of scientific research being published, transforms the process of finding relevant literature into a cumbersome task. The work presented in this thesis proposes a solution that takes full advantage of the support provided by electronic publications and of the current Semantic Web technologies to expose and crystallise the different discourse structures. The goal is to pave the way towards a Semantic Publishing Ecosystem that will alleviate, at least partly, the information overload problem. Our solution relies on enriching scientific publications with explicit rhetorical and argumentation discourse structures, in addition to explicit linear structures for identification and localization, and bibliographic information. 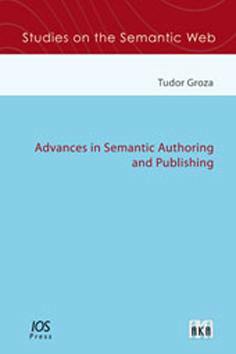 Embedding these structures within the publication documents (as semantic metadata) enables the creation of semantic publications, i.e., foundational artefacts of the Semantic Publishing Ecosystem and linked resources part of the current Web of Data.